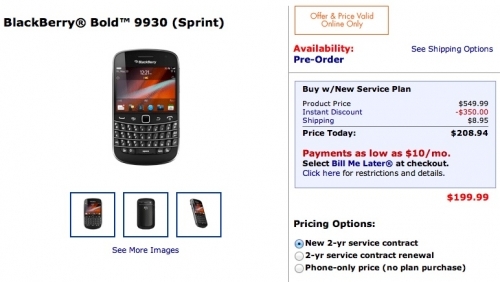 Walmart selling Sprint BlackBerry Bold 9930 for $199 | BlackBerry Blast! Walmart is seriously saving the day by offering the over-priced Sprint BlackBerrys for $50 off. You can pre-order a BlackBerry Bold 9930 for $199 (or Torch 9850 at $99) from Walmart. Check out the link below, enter your zip code and pick yours up today. Why pay $249 at Sprint? Yes, you will still have to sign a 2-year contract with Walmart, but that's standard these days.